Last October footage of a White shark breaching into a dive operators cage went viral around the world. What was the story behind the footage? What went wrong? And what can be done to avoid such incidents in the future? The video was taken onboard one of the live aboard vessels at Guadalupe Island and actually happened at the same time we were operating just a few 100 yards away. By the time we returned to land, the video was global news! A few months on and with a new season on the horizon, we look back at this controversial story and ahead to future operations at the Island. In the now famous movie clip a younger, excited shark grabs hold of the bait on the end of a bait line and not letting go, swims directly, with force into one of the boats cages, right where there is a viewing opening in the bars. The power of the shark hitting the cage and subsequently becoming trapped is enough to force the animal into the cage whereupon it cannot escape. After a few seconds of panic on the sharks part and lots of splashing around, incredibly the shark manages to wriggle free of the cage out of the top opening and over the side, back into the water. Blood can be seen coming out of the sharks’ gills on its exit from the cage but more worrying is of the potential divers within the cage during this ordeal. It turns out (thankfully) that the one diver in the cage at the time had the quick thinking to exit the cage himself once the shark entered the cage. To do this he wedged himself between the bars of the cage and held onto the outside of the cage until what must have seemed like an eternity and he could safely enter the cage once more and climb back onto the boat uninjured. So what went wrong here and what should have happened? All sharks display different behaviours around the boats and when they are interacting with the baits. Sometimes they are lethargic and sometimes they are very excitable. With experience and time you can get a good understanding of how to work with these different temperaments. Even so, we are working with wild animals and no two situations are ever the same. 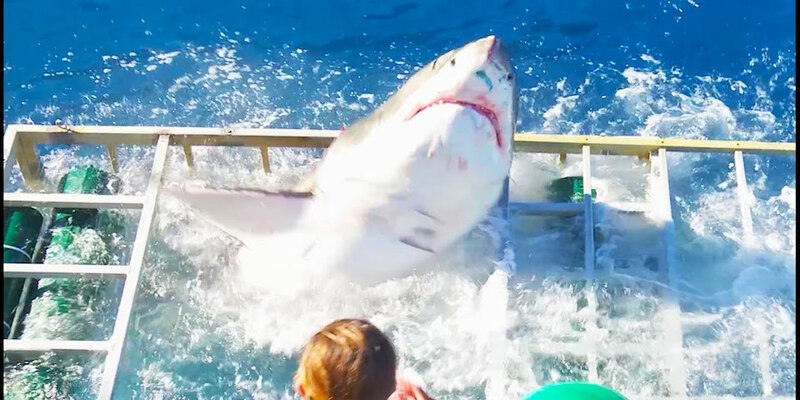 The permits at Guadalupe states that “once a shark takes hold of a bait, the handler must immediately drop the line to allow the shark to swim freely away.” This is because if there is no tension on the line, the shark will swim away from any surrounding objects and a collision with a cage or the boat is avoided. This was the error of this particular bait handler. The moment that shark took hold of the bait, the line should have been dropped to go slack and I am sure the shark would then have had the opportunity to veer away from the cage rather than being “walked into” the cage like a dog not letting go of a rope. Once the shark gets stuck in the cage bars, it has the bait still in its mouth, its eyes closed and with no reverse, kicks its way through the bars and into the cage. I would like to point out two things however. The first is that I believe that in some cases, the best thing to do is to hold onto the line and keep tension. I have had cases in the past were a shark has taken my bait and once the line was given slack, it was headed straight for one of our cages. To avoid contact with the cage, I put tension on the line and “guided” the sharks path to steer the animal clear of objects in the water. This type of reaction is instinctual and happens very, very fast. It takes years of experience to learn, but this is something that I am passionate to teach to our crew to reduce the risks of anything like this happening to us. The second point is that although it is now easy to sit back and point fingers, I personally know that the operation it happened to are one of the best as far as regulations and bait handling go at Guadalupe and as unfortunate as it is, sometimes accidents just happen, especially when dealing with wild nature. I don’t think any blame should be put on the operator involved. When accidents like this do happen, they create global attention and this one was one of the biggest to date! Its the same old story most of the time – “shark gets into cage” “lucky escape for trapped diver” etc. Sensational headlines create a storm of opinions and negative feedback on the situation. The shark is always portrayed as the villain of the piece and the truth of the story is rarely reported. It also fuels the fire for the argument against the practise of shark cage diving, but lets be realistic here, this is just one incident amongst thousands of positive encounters and over a decade of safe practises. That said, we cannot simply ignore what has happened but rather than using it as a negative incident, why not learn from it and look at what can be done in the future to avoid such interactions. The manual of Good Practise or Code of Conduct is “a set of actions to prevent incorrect practises in order to ensure rational use of resources, in this case the great white sharks that regularly visit the coastal waters of Guadalupe Island” issued by Mexican authorities. It covers safety, the boats, cages, diving activities, scientific research and environmental legalisation. All the boats crews should know this manual of by heart and adhere to its regulations at all times. If the operator in the footage had adhered to the rules within the manual, this unfortunate encounter would have been avoided. However, is this enough protection for situations that can unfold in a blink of an eye and does there need to be stricter rules and also some sort of protection for the operation itself if and when an accident occurs? So we are now months on from the footage and the story. What happened in the aftermath and what is in place for this coming Guadalupe season? The operator involved issued a statement soon after the incident and meetings where held involving all vessels management and the Mexican authorities of Guadalupe Island. No doubt, the rule book will be re written once again to try and reduce these types of incidents and operator / crew meetings will be taking place pre season to make sure everything is fully understood and responsibility is taken by everyone. It is possible on site observers may be placed onto the boats to keep an eye on proceedings but that is still to be decided. What is key is that the operators work together on this one and adhere to the new regulations at all times. Not only are individual permits in danger of being taken away but also that of other operators who follow the rules regimentally. The fact is that the sharks need the operators at the island more than anyone. During the months when Great White sharks frequent these waters, the boats are also seen as protectors of the area from poachers and sport hunters. With no-one to protect the sharks they are open to illegal poaching and what was once a protected biosphere reserve would then become a catchers paradise. Whatever comes from this incident, I am sure will firstly be beneficial to the animals and at the same time, allow for the industry to continue safely and successfully into the future.